(PhysOrg.com) -- In a paper published in the US journal Optical Materials Express this week, Macquarie University researchers show that even the earth's hardest naturally occurring material, the diamond, is not forever. Associate Professor Richard Mildren and his colleagues from the Macquarie University Photonics Research Centre discovered that diamonds evaporate under exposure to light. 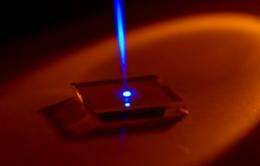 "Although this type of light-induced evaporation has been observed in some materials, this is the first time it's been shown to occur for diamond," Mildren said. The diamonds were exposed to intense light pulses in the UV-C band (the harsh ultraviolet rays filtered out by the ozone layer), and small pits in the diamond surface were visible after only a few seconds. The rate of mass loss in the diamond fell notably for lower light levels but the etching process still continued - albeit at a slower and slower pace, Mildren said. But before diamond lovers around the world start to panic, he is quick to note that the rate of evaporation is very small and not noticeable under normal conditions. In fact, even under very bright UV conditions, such as intense sunlight or under a UV tanning lamp, it would take approximately the age of the universe - about 10 billion years - to see an observable distance, he said. The findings not only provide clues about the long-term stability of diamonds, but also have broad implications for future research. "It's a very practical discovery and we are now looking at how we can exploit this," Mildren said. "If we can make structures in the diamonds that enable us to control the position of the light within a very narrow filament in the diamond, that's the first step to making smaller and more efficient optical devices such as those used in quantum computing and high performance lasers." The discovery may also have implications as far reaching as the prospects for finding diamonds on the surface of other planets, Mildren said. More information: Mildren, R. P. et al. Opt. Mater. Express 1, 576-585 (2011). "ultraviolent laser beam" - that's a good one. Now for the non-violent beam please. "to see an observable distance"
I think he means an observable difference. I believe they've been laser etching serial numbers on diamond for some years now, so light evaporating diamonds is not new. I would be interested if this was done in the presence of O2(air) or in a vacuum. In air the CC bond might break and become CO. This may not happen in a vacuum. Seriously? I'm a lot more worried about when those planck-sized mini-black-holes start evaporating and giving me serious gamma-ray burns over 100% of my body. I have to agree with your first sentiment, it is incredibly annoying that the things cost so much due to market hype for their aesthetic purposes. But I must disagree with your last sentiment, they really do hold value for many applications. High purity diamonds have some incredible electrical properties, but such high purity diamonds are often sought after by the wealthy for decorating their fingernails or dog's collar, it's an insult really. That was my first thought that this could etch serial numbers for preventing theft or returning stolen jewelry. The reason they are saying this is new is because they are showing that the diamonds can be changed under normal light conditions and not just a high wattage laser. To me that sound much like a high wattage laser, and not normal lighting conditions. The rate of mass loss in the diamond fell notably for lower light levels but the etching process still continued - albeit at a slower and slower pace, Mildren said. Diamond is not thermodynamically stable. Graphite is a lower-energy configuration. If you heat a zillion-dollar diamond to 1500 C, you'll end up with a very expensive lump of graphite. Some say that diamond is very slowly decomposing into graphite even at room temperature, assertions by DeBeers notwithstanding. So it should not surprise anyone that application of laser energy might be enough to kick some carbon atoms over the diamond energy barrier. I have read that diamonds exposed to air and heated to around 1000C simply burn like any other carbon. Either way, diamonds apparently are not "forever".